"Miss, we don't play in this school! And we don't learn in this school! We PLEARN! I'm off to do some plearning* now. BYE!" "To question is to grow." "Real leaders face the music, even when they don't like the tune." Child (4 year old): Is it tomorrow? Child: Is IT tomorrow, today? Teacher: I'm not sure what you are asking about - do you want to know if something is happening tomorrow? Child: Is it tomorrow yet? Tomorrow never seems to come? Teacher: (with a smile) Ah! Is it 'tomorrow' today? Child: Yes. Or does tomorrow never come? Teacher: Hmmm. Well I suppose today is yesterday's tomorrow? Child: (Smiles) Yes, that's what I thought. We would recommend these - recent favourites of ours. A gentle book about life…and discovering yourself. Loved the fact that the story takes place between Devon and Berwick Upon Tweed. We've travelled the same routes many times! 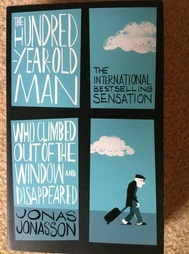 Wonderful book that deals with the current life of the 100 year old man, as well as his life throughout history. A book full of surreal events, that seem utterly believable. Well worth reading. Set in the 1980's in France. 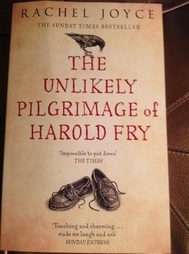 A fairly quick read, beautifully written. 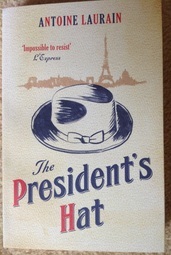 Love the connections that occur…and the fact that Mitterand's hat plays an important role, or does it? Fascinating read that challenges perspectives in terms of interview techniques and questions. Currently considering implications for this in education and preparing students. There is so much to discover in this book! 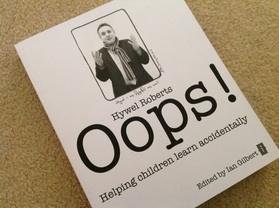 We would highly recommend reading this book if you work or have an interest in education, learning and teaching. 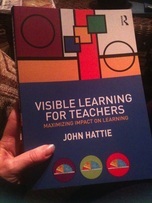 Keep an eye out for Hattie's new book to be released October 2013 - we-ve pre-ordered our copy! A teacher we met originally in Dorset is currently living and working in Rwanda as part of a VSO project. She has set up a website and blog, and is providing resources to schools in the UK (and beyond). A great opportunity to connect with education and life in Rwanda. Check out her website - brilliant photographs and anecdotes about adjusting to life there. We have recently discovered this mapping tool. It is a great way to pin locations onto a world map that can be printed or embedded easily into a website. Even better - it is free of charge for the simple version. Check out our 'Mapping the Single Steps Journey' page to see it in action. We designed and created this website using Weebly and can highly recommend it. Weebly has an area dedicated to use in 'Education'. Website full of inspiration and ideas for developing literacy, complete with video clips and resources. Mainly aimed at Primary classes, but we would argue that many of the clips could be used with all age ranges. Always an updated range of engaging 'talks' about virtually anything and everything! We are watching this grow with interest. TED-Ed aims to share great lessons from great teachers…and build great videos by enabling educators and animators to collaborate. If you need a well-deserved rest and would like to try 'Guest Accommodation' with a difference! The owners have a fascinating story about how they ended up here. They also have a real passion for helping learners in South Africa…and a wonderful collection of art! Nothing is too much trouble for them - 100% about the happiness of their guests. We loved having the opportunity to talk about different places and languages during our recent visit to a Primary School in Scotland. One P2 class wanted to use as many phrases as possible from as many different languages as possible. French, Welsh, German, Spanish…and then a little girl offered to teach us Latvian. Our new learning is how to say 'bye' in Latvian. 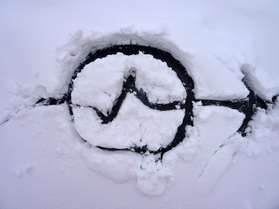 "atā"
Whether it is unexpected weather or situations, we make a choice about how to react. The most creative moments can arise from the unexpected. When given an unexpected opportunity to work in every class in a Primary School on one day - you just can't resist the temptation to teach 300+ children 'The Monster Song'. And kudos to the staff of Cornton Primary, who also unexpectedly joined in during the twilight CPD session! A 'squirrel moment' whilst walking in Roath Park, Cardiff. Exploring feelings and consequences. Have you ever found anything unexpectedly and taken it? Think, Pair, Share - so, where did the cone come from? 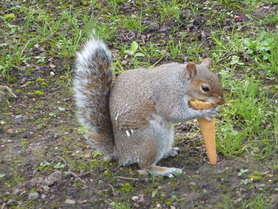 Ratio of cone to squirrel? Ask the class to come up with ways to use the photo?